The holidays are upon us! With this special season also comes the opportunity to dress up for lots of fun events that only happen at this time of year. Along with many traditions that happen such as tree lightings, ice skating, and Christmas markets, it seems like wherever you go there are all sorts of Christmas parties to attend: everything from office parties to house parties to formal events to attend in your community. Even most colleges and schools host their own holiday festivities! And all of these special events call for different festive outfits of course. But with the holidays also being an expensive time of year (hello gift shopping! ), finding party outfits on a budget can be very key. 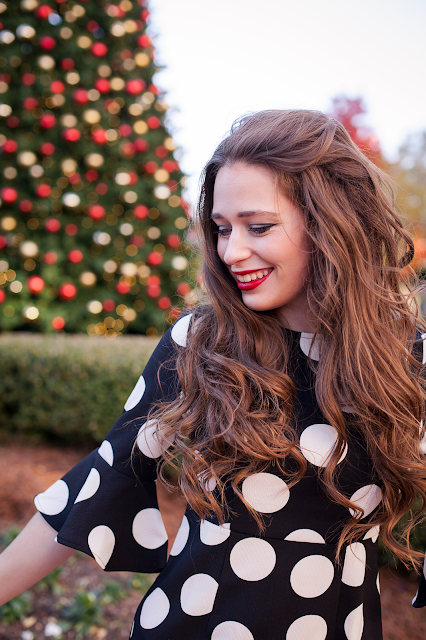 This fun polka dot dress that I am wearing here would be perfect for any sort of holiday party, and amazingly it's under $20!! Talk about a bargain! This dress looks great with pops of holiday reds thrown in against it, which I did by pairing it with dressy red pumps, and a bold lipstick. Now all that you would need is a holiday party! Have you gotten your holiday party dresses yet, and do you have any fun holiday events to attend soon? I'm headed to a housewarming party tomorrow night, and then my roommate and I are throwing a Christmas party for our friends next weekend- and I'm so excited already! OMG that polka dot dress is ADORABLE! I love the crushed velvet one too!! I have yet to try shein, but I'm glad you had a good experience ordering from them! I got my holiday dress from ThredUP this year! Oh this is awesome! Great for my budget! LOVE this! It's so adorable, and I've never heard of this site so thank you for sharing! 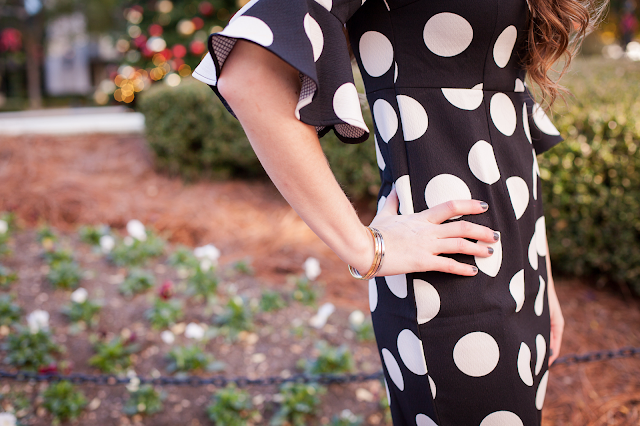 I love a good polka dot dress during the holidays! You look adorable! I love love love that dress! So cute! These photos are adorable! I love the dress and your shoes! Huge fan of Shein as well! I just love all these dresses so great for the holidays! I love the polka dots!! The shoes are adorable too. This dress is so cute and looks gorgeous on you, Annaliese! Perfect for Christmas! This dress really is perfect for the holidays! With all the parties during the season it's so important to have options! So cute! Perfect for the holidays but I could also see this being worn during any time of the year!